Let's look at how one outfit, a spring staple, can be either safe or smokin'. Left, J. Crew cashmere crew-neck and narrow, flat-front khakis, a basic combo that most of us have, in some version. 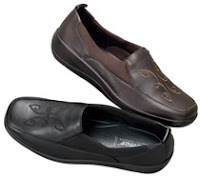 Easy to wear, maybe too easy for the 50+ woman to slip on without much thought, which is what I mean by "safe". Let's start here, it's so much fun! 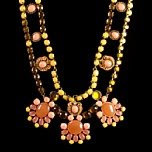 Raise the game with a statement necklace, the jeweled J. Crew Palm Leaf, $175, as shown on the model. Prefer earrings? The Blue Shower chandelier from Matta, at Novica, a lush fall of turquoise for only $68. 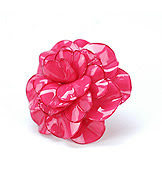 Or Fragments Silver and Pink Enamel Large Flower Ring, below, $90. Any one of these (and I will stop myself here) would twist the clothes from old-school preppy into a definite presence. A bitsy pair of ball studs or that fine gold chain your Aunt Emily gave you for high school graduation. Yes, it's real gold, and maybe sentimental. But it's time to leave them in the jewel box, give them to a beloved girl, or recycle into something that's "you" now. I find the traditional engagement ring set also conventional, and jarring with sportswear. Wear just the band. For a fresh look, wear the band with a second, thinner band, a coloured-stone guard band in emerald, amethyst or tourmaline; this is a less aging style. Dark leather in spring screams "practical". Still, I see them all the time, as if a woman just grabbed what's there in the hall closet. Hobo leather bag, $65, from Apple seeds. If there's one thing that makes or breaks a spring look, its a seasonal bag. J. 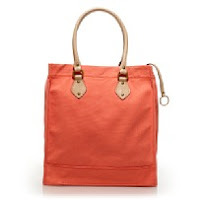 Crew Magazine tote in orange, $78. A shot of colour sure tarts up the neutrals! Durable and plain slip-ons; Regal Loafers, $88, from Appleseeds. Oh god, I hope I never see these in person. 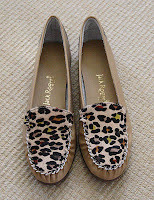 Jack Rogers leather loafers, tan with pony hair top, $135 from SandalWorld. You don't need all these accessories. Any two will do the trick. Colour and risk- fleeing the too-practical- are the keys to a fresh, vibrant wardrobe, even if the clothes are dependable basics. I'll be bringing out some favourite spring accessories, and buying just a few more as I greet the return of light, birdsong and no winter boots. I see way too many of those 'safe' options out there! Unfortunately, too many people wear "safe" clothes and "safe" accessories together. Then they wonder why they're invisible in public. As you said, it doesn't take much to lift the outfit (and wearer) to a more interesting image. Love those animal print loafers, by the way. 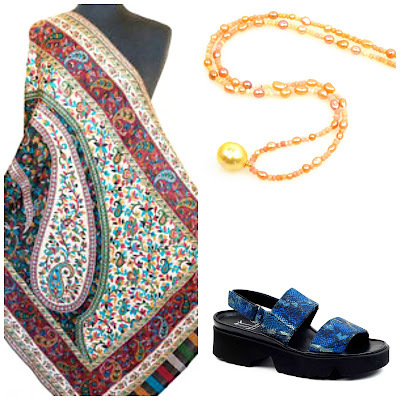 Whoa, those shoes from Appleseeds would go great with the patchwork dress on my blog!!! Wow! You are good at this. Wonderful inspiration. More please. Karen, yes, that would complete the religious fundie look epitomised by the "modest" dress you show. Are the turquoise earrings set in silver? I can't wear anything but gold or silver in my ears, though I love costume-jewellery earrings. O some you can change the part that goes in the ear for a silver or golden hook. lagatta: It is silver; the turquoise is only one of the stone options. Frugal: Thanks, I'll take requests if you have something in mind. nanflan: I want those too! Karen: Agree- sometimes I'm surprised how earnestly this kind of thing is presented as desirable, but there are all tastes, non? Just stopped by to tell you how much I am enjoying your blog. Good reminder for us all not to slip too far into "safe" territory. Why go for safe when you can go for fabulous? I stay waaay too much in the safe side. I must try to get a bit more smokin! Oh, I am in Australia and we do not have the range of clothing etc for we do not have a large population. lady jicky: I live in Canada; we don't have anywhere near the choice that the US has. 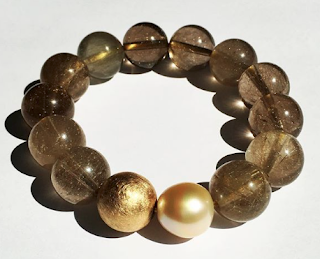 A good mail order boutique can be a wonderful thing! Thanks Duchesse, the earrings are definitely my thing - I love "ethnic" silver earrings, but want a bit more colour and fun. The colours in the original outfit are not mine- trousers, if worn, would be black (ample, though firm, bum) and top a smokey violet or an interesting red or green. Skirt preferred to trousers if possible... Saw the loveliest reddish-brown Italian wool knit, can I find a seamstress to copy a skirt I love that is getting ratty? This, at a shop called "Madeleine soie et laine". Thought I needed a new spring post and now I've got the perfect justification -- Duchesse says . . .
lagatta: I too prefer skirts. 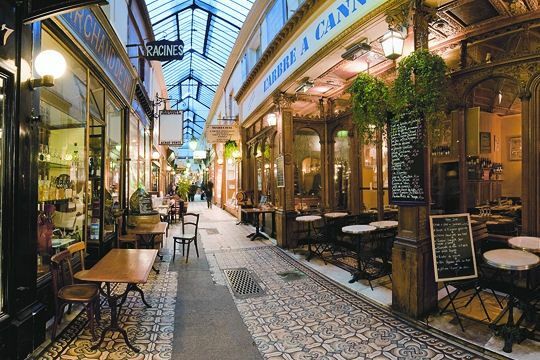 I'll have to check that store when I'm in Montreal! materfamilias: "New spring post?" Fortunately they are free! Just want to make clear that "Madeleine soie et laine" is a fabric shop, not a clothing boutique. It is on St-Hubert, near Beaubien métro. Sewing mavens here are still mourning Marshall's Silks, the quality fabric shop in the city core. Madeleine is very nice too, but much, much smaller. lagatta: So I thought. A beautiful fabric store would motivate me to find that perfect dressmaker. Way too much safe out there, and yet people wonder why their voice is not heard? I guess I am echoing Nan here, but really, it is far to easy to disappear as we grow older; we need to grow bolder in expressing ourselves. Just a little thought and style can make such a big difference.